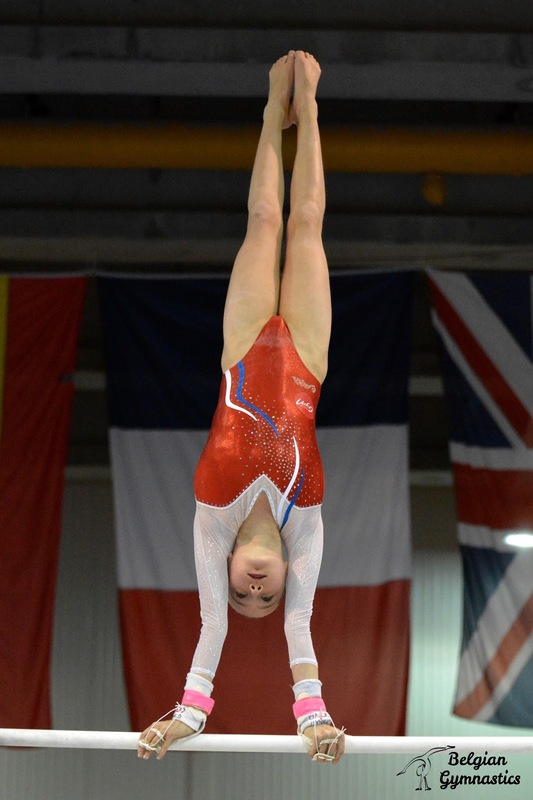 Belgian Gymnastics: 2017 Top Gym : Martina Dominici dominates the 20th edition ! 2017 Top Gym : Martina Dominici dominates the 20th edition ! Last weekend, the Top Gym celebrated its 25th anniversary and its 20th edition. 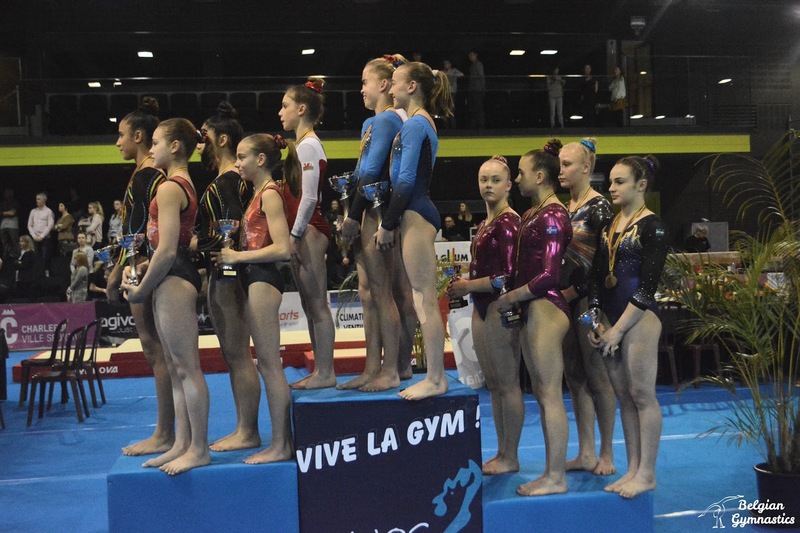 For that occasion, the Gymnos de Charleroi invited prestigious countries that made history at the Top Gym. But in the end, it is what we can call a small gymnastics country that came on top, with Argentina's Martina Dominici dominating the competition on both days to win 5 medals ! On Saturday, she won the all-around competition which, for the first time in the tournament's history, had to be organised in two subdivision. Dominici showed great execution and loads of difficulty, to win gold with 52.516. 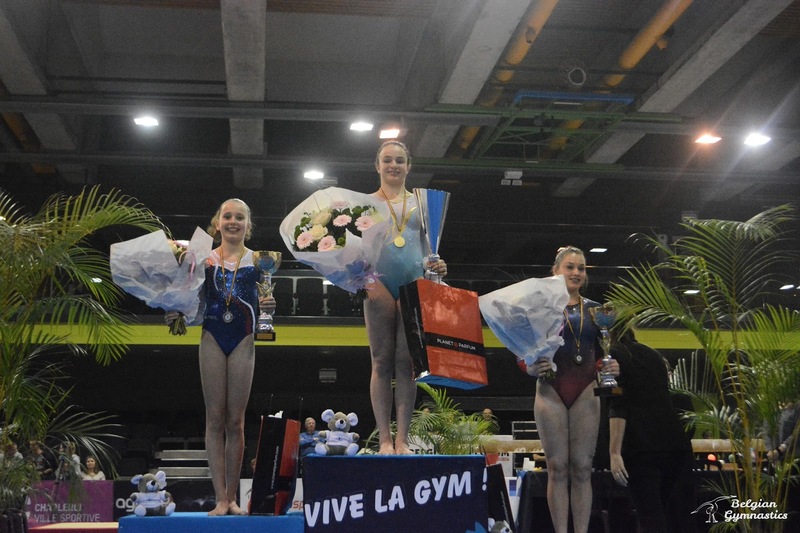 Mathilde Wahl, from France, won the silver medal, thanks to her great work on bars and a beautiful floor routine. She earned 51.149. In 3rd place, we find Kaytlyn Johnson, from the club of Denton, who impressed with her double twisting Yurchenko on vault (50.700). 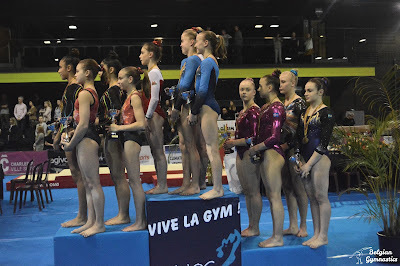 On the Belgian side, our country was represented by Cassia Priels and Isabella Jorio for the Gymnos Charleroi, and by Cato Fleurackers and Lisa Vaelen for the Gympies Keerbergen. Lisa got the highest ranking, with an 8th place (49.482). Cato placed 19th (47.250) and Cassia was 23rd (46.683). Isabella started off really well on vault but looked injured and had to withdraw from the competition while performing on the balance beam. On Sunday, Johnson added a gold medal to her collection, as she won the vault title, thanks to her power, and a great DTY, ahead of Dominici and Czech Republic's Dominika Ponizolova, who won the bronze medal just 0.025 ahead of Julia Forestier (France). Martina Dominici then went on the win the bars title and add yet another medal to her collection. She took the gold ahead of France's Mathilde Wahl and Romania's Iulia Berar, who won Romania's sole medal at this year's Top Gym. On beam, Sweden's Jessica Castles came on top to win the gold with a beautiful and difficult exercise, ahead of Julia Forestier from France, and Martina Dominici, winning here her 3rd medal of the day. The floor final promised to be really exciting, with gymnasts such as Zoe Simmons from Wales who showed a double front, or Romania's Silviana Sfiringu who has a piked full-in. But in the end, it's Great Britain's Amelie Morgan who won gold, with a complex yet perfectly controlled exercise. Jessica Castles (SWE) and Zoe Simmons (WAL) picked the silver and bronze medals. For years now, the Top Gym has been known for is very particular team final format. Two countries are paired and compete together to win the title. Jolie Ruckley and Zoe Simmons from Wales, paired with Mari Kanter and Julie Rottum from Norway won the team gold. Just behind them, we find Great Britain's Amelie Morgan and Phoebe Jakubczyk and Canada's Quinn Skrupa and Lucia Jakab. Martina Dominici, paired with Cassia Priels (Gymnos) and Iceland's Sonja Olafsdottir and Vigdis Palmadottir won the bronze. Busy schedule for Team Belgium !